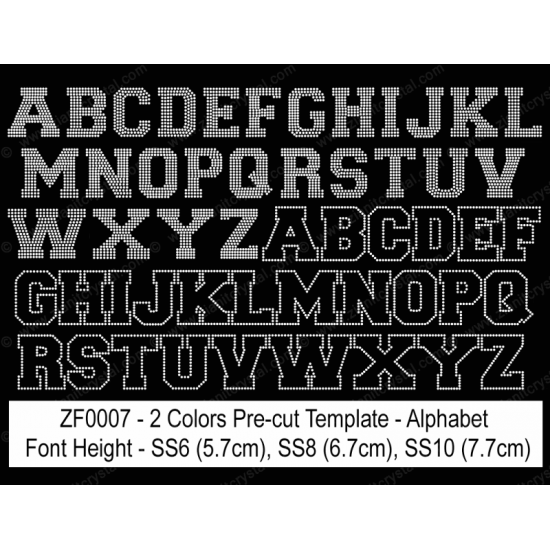 ZF0007 rhinestone font template set will include alphabet template as shown in the picture. You will receive 52 pieces of individual template characters and to utilize multi-color features, please watch the video below. You may use Swarovski, Preciosa and any other brands of Hotfix Crystals. Video the video below on how to use the multi-color template to create your rhinestone design. ZF0095 rhinestone font template set will include alphabet template as shown in the picture. You will receive 52 pieces of individual templat..